Drop us your email to stay in the know about new features and updates on our Songwriter’s Notebook ! 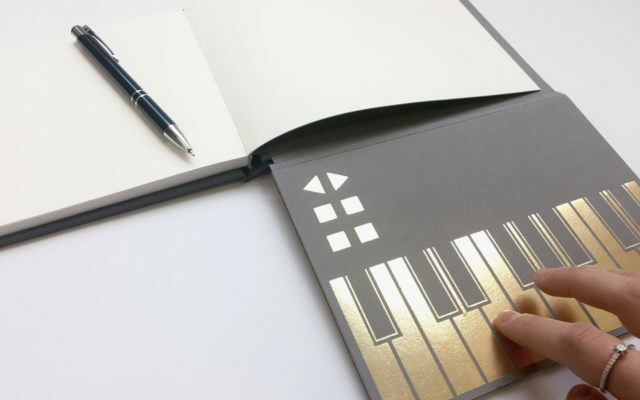 Printed touch technology allows you to play the piano keys with the touch of your fingertips. Connect your notebook to our free app via Bluetooth or use as a standard MIDI piano with your favourite music app. 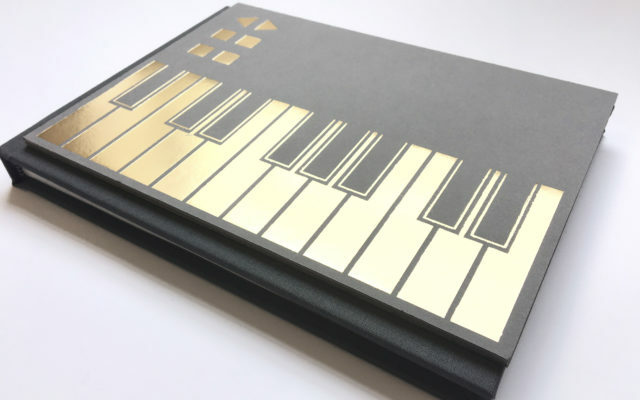 Hardbacked notebook encapsulated in grey cloth with gold foil stamped logo and piano keys. Index pages to the front and numbered pages throughout the notebook. Designed with the music creator in mind; this book is for anyone who might enjoy capturing a few musical notes along with their written thoughts or sketches. Connect to our simple app for a musical visualization of notes as they are pressed, record function for notes and vocals, as well as the ability to play back or export your recorded music. Folding out from the back is a bluetooth MIDI piano keyboard. The keyboard is easily accessible whilst the landscape notebook is open on any page. The keyboard can also fold backwards so that it is useable whilst the book is closed similar to a regular MIDI keyboard. Contact us and let us know if you have any questions about our Songwriter’s Notebook or are interested in creating a bespoke project based around this interactive style book.